Two Become One | The Size of a Mustard Seed. Matthew 17:20. As shown to us by the prior saint post, there is something very beautiful in the love of a family. This love is not the fairy tale-fake-fruity- love shown to us in movies. No, this love is real, vital, sacrificial, merciful love. The love of a family reflects the love God has for us. Of course, we live in a broken nature and sadly this love is not always given as it should be. But we all know the love that God the Father has for us and this in the end is all that matters. A family is simply partakers in this divine love. This is what makes families so special. It is a unity of people each looking to do the best for one another, always with a heart filled with forgiveness and understanding in case someone trips a bit. All of this beauty begins with an even greater beauty…the one found in people living out their vocation. God made each of us with a specific plan in mind. This plan includes our vocation in life. It is in knowing, loving, and serving God through this vocation where we find true joy and fulfillment. This is exactly what Blessed Louis and Zelie Martin’s lives show us. Louis and Zelie were a beautiful French couple. They married on July 13,1858. They owned a small watchmaking/jewelry and lace business near their home. One thing that I find very beautiful about their relationship is that they would inspire one another with their love of God. They were leading each other to holiness! This of course is one of the most important parts of the vocation to marriage. And these Blesseds’ are a major inspiration to many couples! Bl. Louis and Zalie went on to have five beautiful girls. The second youngest was St. Therese of the Child Jesus! Incredible isn’t it? These saintly parents raised a doctor of the church! It was in their beautiful home that St. Therese learned to love, trust, and live for our Lord. It was her holy parents who set the foundation for one of the most incredible and beloved saints we have ever known. Although, as if this wasn’t enough, they also did many other beautiful things. With their love and care, they were the head of a true Catholic home. A home were God and the Church was the center. They knew that their mission was to raise five saintly Catholic women. And their mission was surely fulfilled! After fifteen years of their marriage, Zelie was diagnosed with breast cancer and passed away that same year. This left Mr. Martin and the five girls to continue together. We see in St. Therese’s writings the impact and the presence that their mother still had in their household. 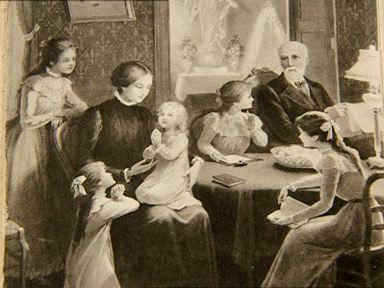 Their Father continued to lovingly care for his daughters and had a beautiful fatherly relationship with each of them. Through all of this care, love and guidance the girls continued to grow and mature in their love for God. All five of their daughters went on to enter the convent and become brides of Christ! What a beautiful saintly family! And what inspiring set of parents! They lived their vocation incredibly, and thus their daughters went on to live their glorious vocation! Here we see the joy and love for God that they had through this. Let us pray for this grace to follow the plan that God has for each of us! To always love and to always have our lives point to the beauty of God! Blessed Louis and Zelie Martin, Pray for us!